We were able to access the listing for ourselves on Famebit and confirm that it exists. Our article has been updated with screenshots and that confirmation. For the unfamiliar, Famebit works to connect advertising agencies and marketers with content creators to coordinate promotional material, influencing so-called "influencers" for the purposes of sponsored content. 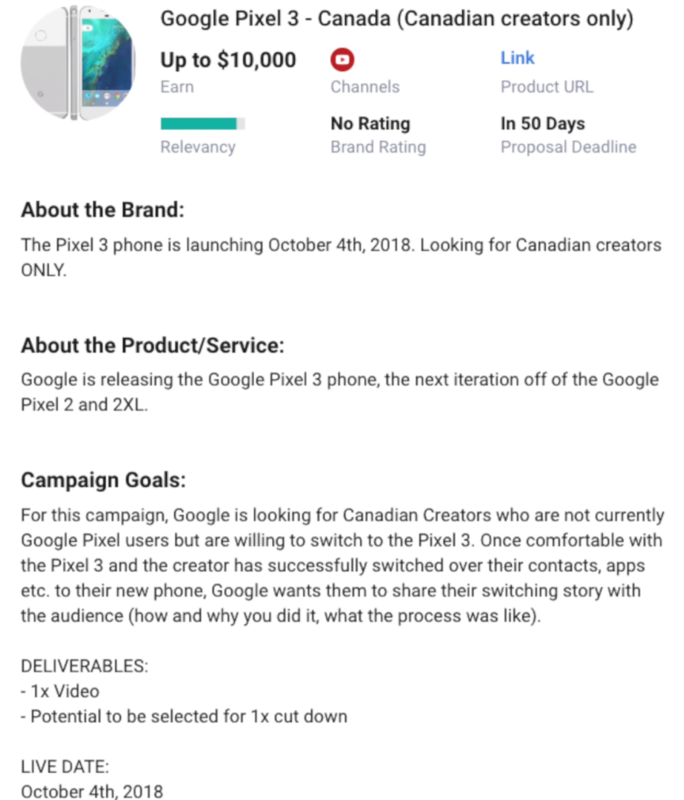 In this case, the posted ad was allegedly created by Google itself to promote the Pixel 3 in Canada, with a description that notes, "The Pixel 3 Phone is launching October 4th, 2018." 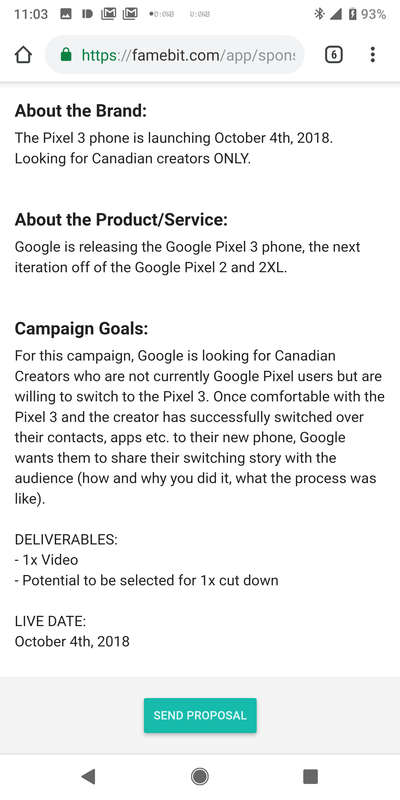 That date lines up historically with previous Pixel announcements, which have all been revealed by Google at its now typical "Made by Google" October 4th event. 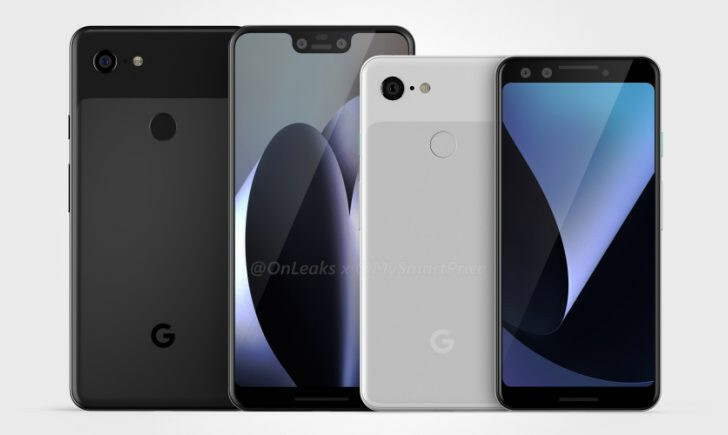 Historically, Google hasn't actually shipped devices at that announcement, and although the listing does state that's when the phone will "launch," the word hasn't always been synonymous with actual availability. Now, it's possible that this ad may not have been legitimately created by Google. 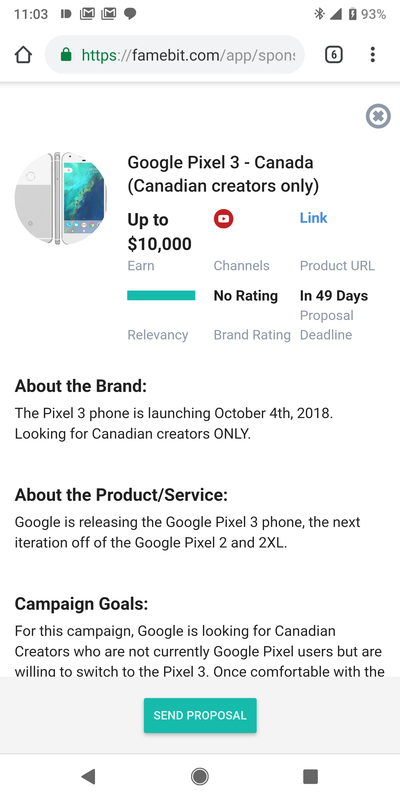 Although we were able to access the listing ourselves, we can't verify if Google is, indeed, the author behind the posting. It's possible this could be an elaborate hoax, but we don't think that's too likely. 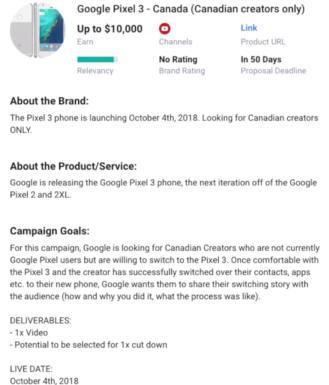 Google has been consistent with these dates for several years, and the strange specifics in the ad itself add some credibility, implying some poor employee in a Canadian arm of Google's marketing department just didn't pay attention. Either way, we'll know more in precisely two months.